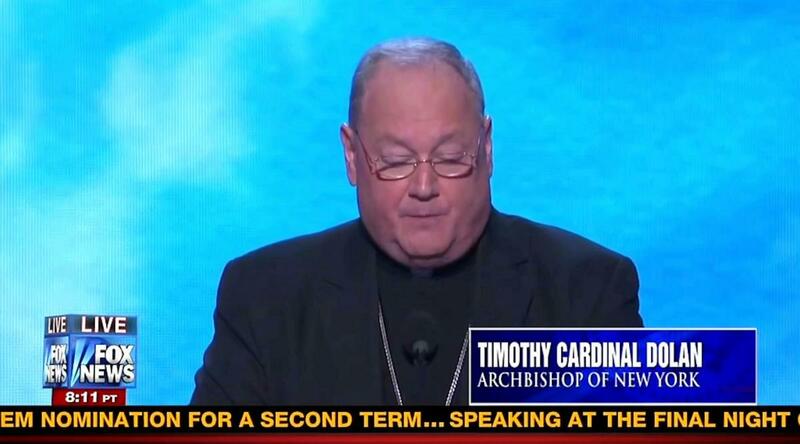 After offending religious Americans by appearing to boo God, the Democratic National Convention had the top ranking Catholic official in the country perform the closing Benediction Thursday night. Cardinal Timothy Dolan did the same for the Republicans last week in Tampa Bay, but those delegates didn’t seem to have a problem with a party platform that included God and Jerusalem. The only networks respectful enough to show the prayer in its entirety without interruption was Fox News, Fox Business and C-SPAN. ABC, CNN, and PBS kept it in background while talking over it. MSNBC completely ignored it, cutting the audio feed to let their pundits share their opinions without distraction. CBS and NBC returned to local news affiliates as soon as he began. Two minutes after he finished however, PBS reporter Ray Suarez commented on how "combative" Dolan was. "20,000 Democrats had to stop in their tracks" to listen to him. Suarez then summarized how Dolan just had a "long riff" on religious liberty. The content of the prayer was surprising and controversial to some, considering where he was. The Archbishop defended the right to life of the weakest and smallest among us. Thus do we praise you for the gift of life. Grant us the courage to defend it, life, without which no other rights are secure. We ask your benediction on those waiting to be born, that they may be welcomed and protected. He continued with a defense of traditional marriage, scolding one of the major platforms of the convention. Show us anew that happiness is found only in respecting the laws of nature and of nature’s God. Empower us with your grace so that we might resist the temptation to replace the moral law with idols of our own making, or to remake those institutions you have given us for the nurturing of life and community. The decision to include him wasn’t an easy one for the DNC, despite his ranking and esteem among American Catholics. The head of the Archdiocese in New York and president of the Conference of Catholic Bishops has included himself in a conflict with the Obama administration over the contraception aspect of the Affordable Health Care Act. A mandate that went into effect on Aug. 1. In an interview with the New York Post on Aug. 24, Catholic League President Bill Donohue criticized the DNC for not following the GOP’s lead by extending an invitation to Dolan. The Republicans are smart enough to get the ‘pope of America,’ and the Democrats are stupid enough not to invite him. The Catholic vote is the most critical vote. They’re the wild card. So, why wouldn’t you ingratiate yourself to the pope of America and send a wink and a nod to Catholics? That’s just good politics. They must’ve listened to Donohue’s advice, but the major networks had no interest in giving the Cardinal any respect – cutting him off before the prayer even started. We beseech you, almighty God to shed your grace on this noble experiment in ardored liberty, which began with the confident assertion of inalienable rights bestowed upon us by you: life, liberty, and the pursuit of happiness.